10 kS/s maximum when using the single ended DMA channel for for analog ouput. 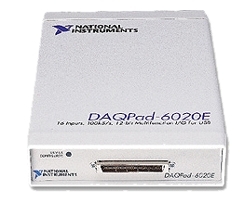 1 kS/s maximum when using the single DMA channel for either for either analog input or counter / timer operation. Note: Accuracies are valid measurements following internal calibration. Averaged numbers assume dithering and averaging of 100 single readings. Measurements accuracies are listed for operational temperatures within ± 1 degree C of internal calibration temperature and ± 10 degreesc of external or factory calibration temperature. One year calibration interval recommended. The Absolute Accuracy at Full Scale calculations were performed for a maximum range input voltage, 10 (for example, 10V range for ± 10V range) after one year, assuming 100 pt averaging of data.